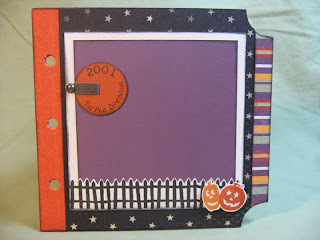 Halloween 2-page layout: Will you win it? 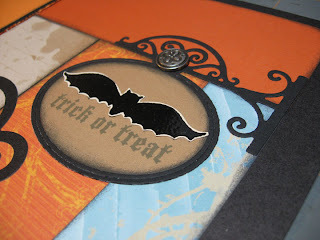 I seriously love Halloween, so I had to create a BONUS Kit of the Month for October. I designed this two-page layout for you! Notice no title. My title is going to be "Going Goth" and I didn't think that would apply to most everyone else, so you can be creative with your own title and I'll supply the rest. 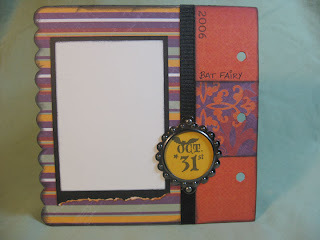 This kit is $15, but if you leave a comment on my blog by October 15th, your name will go into my drawing for a FREE kit! 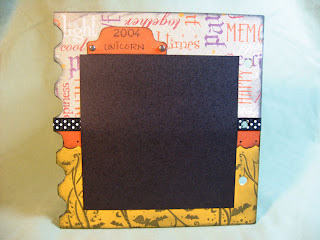 Each kit includes everything you'll need including color photos, instructions, embellishments and more. Contact me now to hold your kit. Payment is due once I have your kit packaged up and ready for delivery. They will be available through October 31st only. The drawing will be held October 16th and the winner will be posted here. 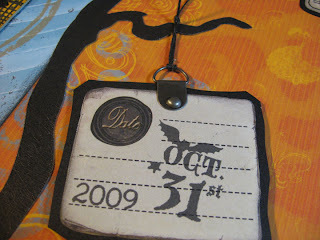 Close-up view of the date tag. Chipboard name plate (Z1223) with black dotted organdy ribbon. 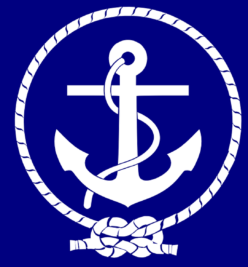 Photograph tab on main photo. 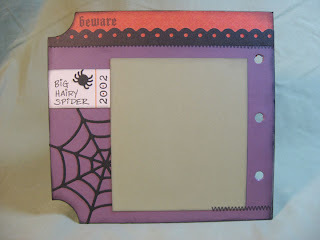 Trick or treat sign (from QuicKutz) is stamped with CTMH stamp set "Beware" (D1381). 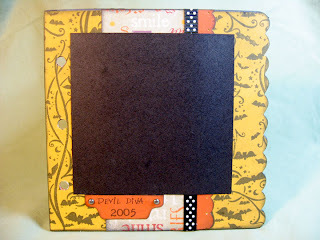 Pewter accent is from CTMH's Pewter Mini Medley Accents (Z1243). Easy to order through my CTMH website. 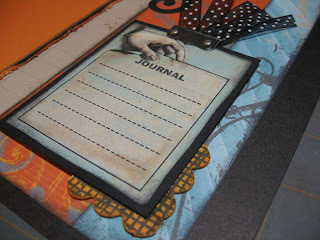 Journal tag, chipboard accent, pewter hinge and more ribbon. 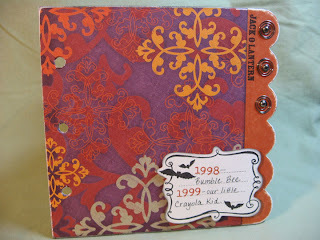 The papers used here are from CTMH's "Free Spirit" (X7088B) and "Notebook" (X7102B). All items are easy to order through my CTMH website. Ahh, my love affair with coffee. This card couldn't have said it better... "You're the mocha latte in a world full of cheap machine coffee." I'm sorry. Call me a coffee snob, but I just can't take coffeemaker coffee anymore. I simply love my Americano! For those of you who don't know, an Americano is deliciously dark and earthy espresso added to steamy, piping-hot water. A touch of cream finishes it off beautifully. When I gently remove the lid from that Starbucks cup, it's like a vision of loveliness. A slight, steamy froth clings to the surface of that rich, bold brew and the smell of it sends me to a place of otherworldliness. But nothing - - nothing in this world can come close to that first delicious sip. It's beyond words for me... but if I had to pick one word, it would be... p e r f e c t i o n.
On that note, I will get back to my Mojo Monday sketch submission this week. Here's the sketch, and here's my card. 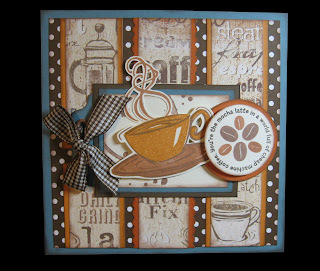 I had fun going to my stash of "other" products, but just had to use the Coffee Shop stamp set from CTMH for my main cup image front and center. Alas, this wonderful stamp set was retired last year. Here's what I got done today. I am itching to get the photos of my Jamie into this book. She's been so many cute things over the years for Halloween. Hopefully tomorrow I'll get the album finished (only two more pages and the back cover to go) and then I can hunt down the photos and put them in place. I'm new at this whole blogging thing, but I'm going to try to post a slideshow when I get all the photos down and the whole thing complete. 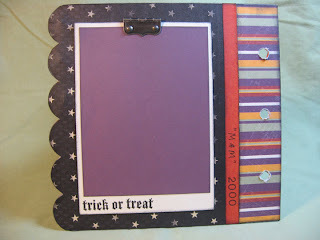 Currently, I'm designing a Halloween mini album I am offering as a workshop on October 11th. 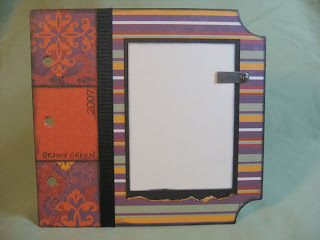 I am using Close To My Heart's new My Creations™ All Sorts Mini Album which measures 6 1/4 " x 7" and each chipboard page has a different edge. 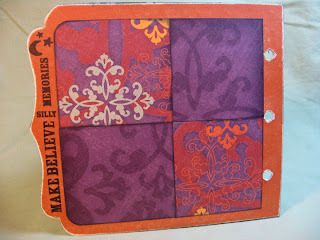 I'm using the Enchanted papers from last Autumn because I love them so much, plus a few sheets of the star paper from Game On. 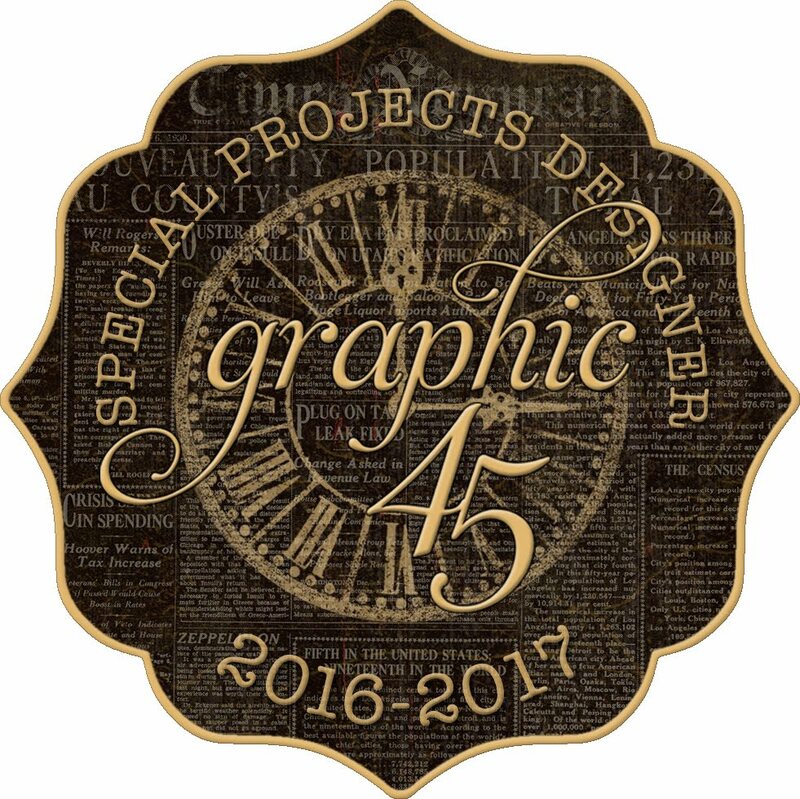 I'm also including some pewter accents such as Foundry Bookplates and CTMH's new Mini Medley Accents Collection. It's just in the design stage now, so I thought it might motivate me if I showed you my progress along the way. I have several pages yet to go, so here's a look at how I'm doing. I'd love to have your comments. Mojo Monday #105 - My First! 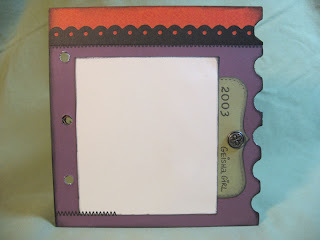 This is my Mojo Monday #105 card that I posted for the first time. I couldn't wait for October to get here, so I'm rushing the Halloween thing a little. 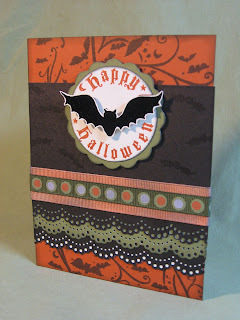 All products used in this card are Close To My Heart except for the scallop punch border which is Martha Stewart. 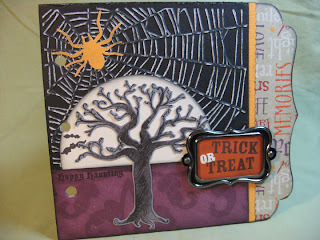 The stamp set is called "Beware" and it's absolutely my favorite Halloween stamp to date. I embossed the bat in black and popped him up with foam tape. The ribbon with the dot is from the sadly retired Autumn Terracotta ribbon rounds. I hit it with a little black ink on a sponge. 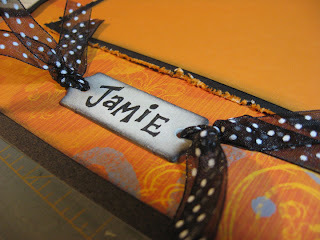 The wide ribbon behind it is CTMH's White Daisy grosgrain (3/4 inch) that I sponged with Autumn Terracotta and Black ink. 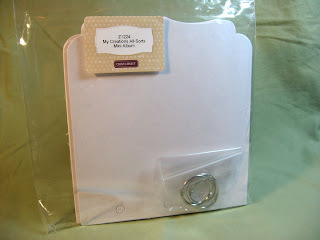 You can purchase Close To My Heart products from me on my CTMH website. No creativity today, unless you count making my own Americano with my new Espresso maker. That was a delicious work of art! No, Sundays are usually devoted to grocery shopping, cleaning up around here for the coming week, and having lunch with the in-laws. It's definitely a family day. 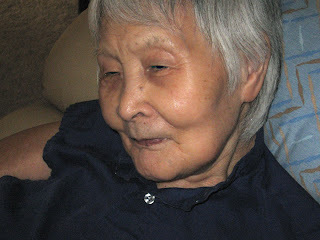 My mother-in-law, Saiko, is 88 and has recently been diagnosed with the advanced stages of Parkinsons. Sure, we knew she had the shakes, but we have discovered it's so much more than that. Before you feel badly for her, realize that finding this out at her age is actually a very good thing. The medication she is taking (Sinemet) can have some powerful effects to improve her condition and she can eventually take a strong dosage which will have even greater effects. After taking it for one week, we are seeing her walking better, her eyes are brighter, and her strength is coming back. We are feeling very encouraged. And to think, we were thinking she might not make it to Christmas this year. I have a feeling she's going to be around a long while yet. Today after lunch I played a little brain-game with her. Sort of like the shell game but with three playing cards, one of which was the Joker. After showing her the three cards on the table, I turned them face down and began with a simple scramble. She found that Joker right away. She said it was too easy. I increased the scramble difficulty little by little, and when I found I couldn't stump her, I called in my husband Paul and had him give it a shot. She simply didn't miss. It was pretty impressive. Her only comment was, "I guess I'm not coo-coo yet." My father-in-law, on the other hand, didn't make it to the second round. He's got no condition, other than being just a silly old guy. She hates getting her picture taken, but I took this of her today. I told her she didn't have to look at the camera and although she still didn't like it, she fussed with a grin on her face. I find her to be such a pleasure. I hope you can see how special she is. First day of blogging for me. Had to get my 11-year-old to help me get it rolling. Sad truth. I have struggled for months over whether I should even blog in the first place. What's the purpose? I thought blogs were purely for the narcissistic. Still kinda feel that way, but figured that it might be fun, and it might lead me somewhere in this life of mine that seems to be on cruise control. For the most part I'll be making an effort to blog in a positive and inspiring manner, but life isn't always positive and inspiring, so we'll just see how it goes. So here's how I see it happening. 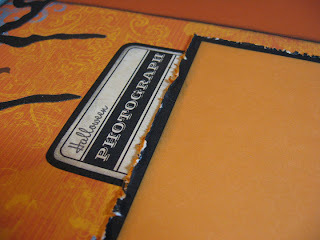 As a former graphic designer-turned self-proclaimed- papercrafter-extraordinaire, my days are filled with creativity. 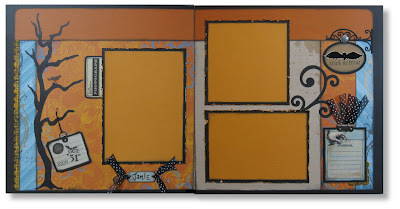 Each day is a journey, a creative journey. Thus the title. I currently work at home as a Close To My Heart Consultant, and I work pretty darn hard at it. Just ask anyone. It's a lot of fun - truly - and I have made some pretty great friends doing it. So I will likely be posting a lot of my artwork and happenings with my business. But you'll also get a glimpse at my perspective on daily life and that's where the narcissism kicks in. So if you enjoy that kind of thing - great.